The narrow Shenandoah National Park winds along the crest of the Blue Ridge Mountains in western Virginia. While the 105-mile Skyline Drive is the highlight of the park, there are also copious opportunities all kinds of outdoor activities, including hiking and camping. The park’s lodging options include a few different campgrounds and two main lodges, Big Meadows and Skyland Resort. Shenandoah National Park also allows for back country camping throughout its nearly 200,000 acres. The northern entrance of Shenandoah National Park is near Front Royal, Virginia, a quick journey up Interstate 66 from the Washington, DC metroplex. There is a $15 dollar fee to gain access to Skyline Drive, although an annual pass from the National Park Service covers this cost. 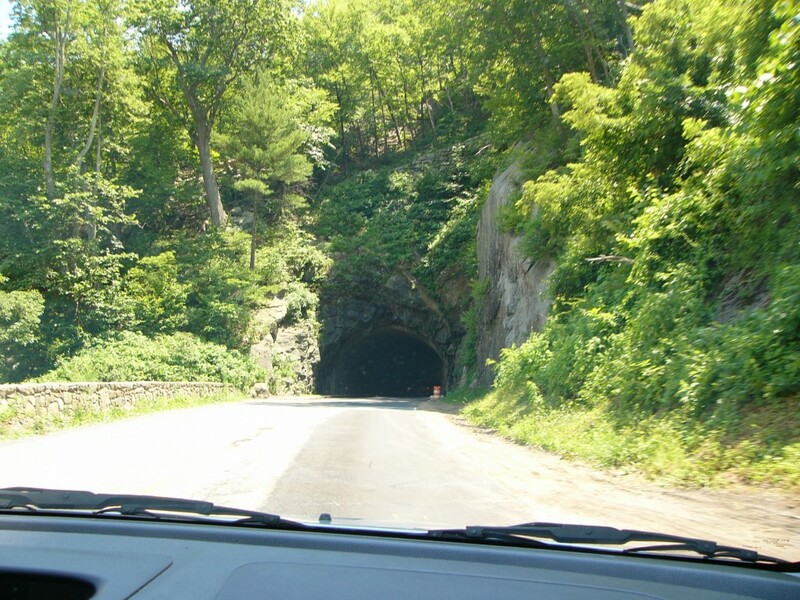 Getting ready to enter one of Skyline Drive’s tunnels. Photo by Angela Williams. Driving Skyline Drive is the highlight of the park for any roadie. Its 105-mile length winds gracefully back and forth along the crest of the Blue Ridge before “transforming” into the Blue Ridge Parkway at Rockfish Gap. There are many places to pull off the road and gaze either into the Shenandoah Valley or at the scenic views that lie to the east. Shenandoah National Park features a few visitor centers and exhibits along the length of Skyline Drive. The largest of these is the Byrd Visitor Center at Big Meadows. The exhibit here describing the development of the park and the acquisition of land through eminent domain is especially interesting. The two main lodges in the Shenandoah are located pretty close to each other. The lodge at Big Meadows is also a short drive from the Byrd Visitor Center. Both lodges feature excellent restaurants and Big Meadows also has a quick serve restaurant and groceries at the wayside next to the visitor center. The beautiful view behind Shenandoah National Park’s Big Meadows Lodge. Photo by Angela Williams. The lodges were built in the 1930s soon after the park itself and thus sport a rustic feel similar to the Blue Ridge Parkway’s Bluffs Lodge. A short hike behind the Big Meadows reveals gorgeous views of the Shenandoah Valley and also decent cell phone service. The park’s many campgrounds also include the Lewis Mountain Cabins for travelers wanting a true old-style cabin experience. 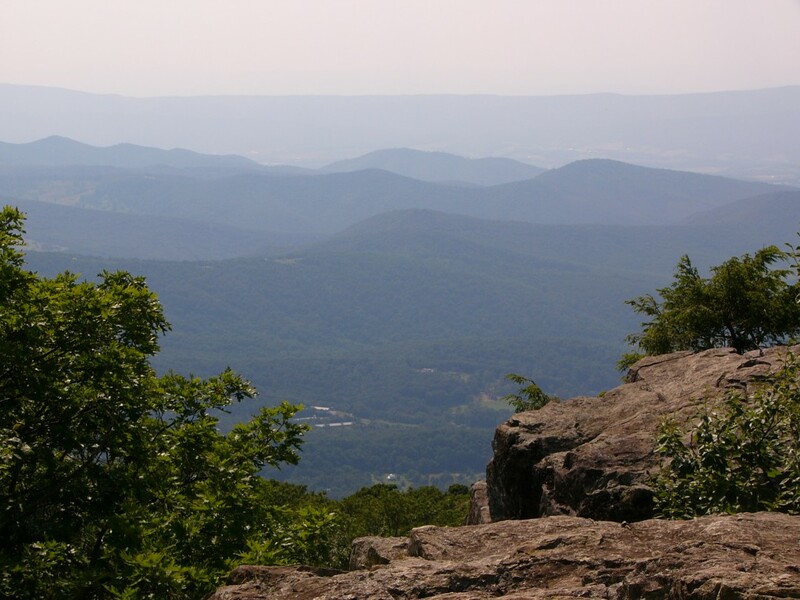 In addition to the campgrounds, back country camping is allowed through most of Shenandoah National Park, provided campers follow the”Leave No Trace” policy. The park’s many hiking options feature the Appalachian Trail and also many scenic waterfalls. Most of the trails are easily accessible from Skyline Drive. The trailhead for the popular Dark Hollow Falls trail is located near the Big Meadows lodge. Shenandoah National Park makes for a perfect weekend getaway from the bustle of Washington, as well as a great family vacation during the summer or fall. And of course, Skyline Drive is one of America’s greatest two-lane roads and a must see for all roadies. Check out these following two books suitable for any journey to Shenandoah National Park.